We love a good old roast lamb. It is a stable on a Sunday when we have our traditional Sunday roast. This recipe is one that I just whizzed together when I seen I had some fresh herbs lying around. We would normally be content with a simple roasted joint seasoned generously and carved for dinner, until now. This is now the normal fayre when I make roast lamb. 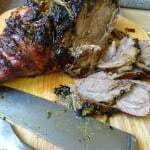 The rosemary and thyme are perfect with lamb as is the garlic and mint and have always been a classic combination. This marinade has the added tang from the lemon but as this always goes well with rosemary marries everything beautifully together with the juicy and tender lamb. So if you fancy jazzing up your normal roast lamb try this and I guarantee you will not go back. The leftovers also make great sandwich or flour tortilla fillers and can really add that little extra to a salad of quinoa and mixed beans. 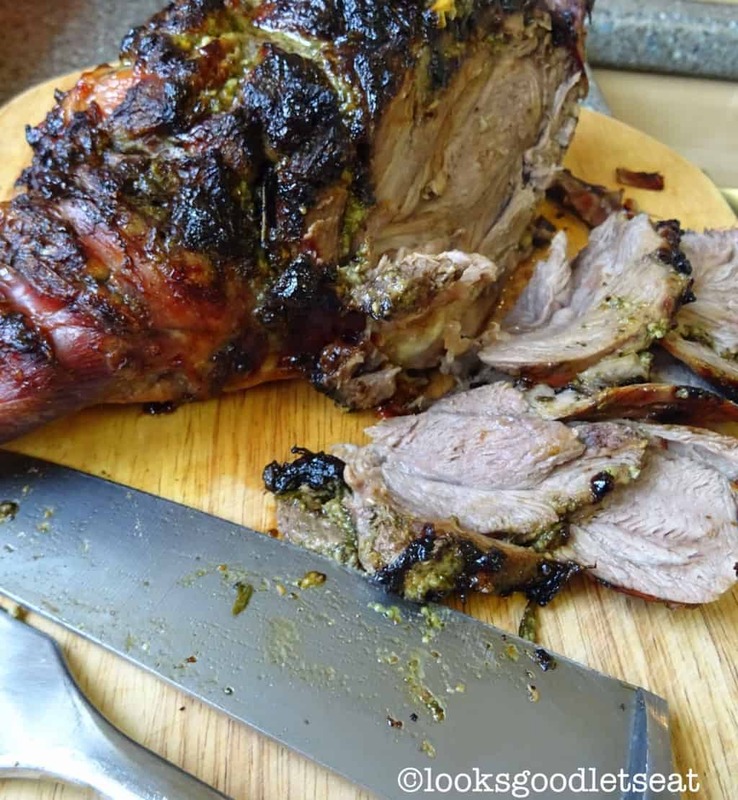 Is lamb one of your favourite roasts. Try this version and enjoy the delightful flavours that bring this lamb to life. First make the marinade by putting all of the ingredients in to food chopper or pestle and mortar and blitz / pound until a thick paste is created. If it is too thick you can add a little water at a time to loosen it until the desired consistency. With the lamb score the top over the skin about half a centimeter down and about an inch apart. 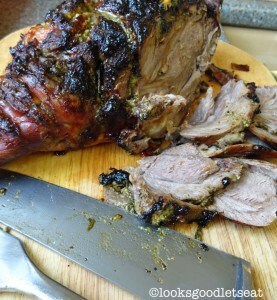 Rub the baste all over the lamb and then refrigerate for about 2 hours or over night if you have time. Remove from the fridge half an hour before cooking. Pre-heat the oven to 200C. Place the lamb in the oven on a roasting tray and then cook for 30 minutes of which then turn the oven down to 160C and cook for a further 1 hour and 10 minutes. When cooked leave to rest in the pan covered in foil for 20 minutes. Carve when ready and serve with crispy roast potatoes, your favourite vegetables and gravy. Rare – 15 minutes per 500g plus 20 minutes. Medium – 20 minutes per 500g plus 20 minutes. Well done – 25 minutes per 500g plus 20 minutes.